What do you do with leftover wine (leftover what??!!) Put it in a cupcake! I can’t think of a better happy hour treat that a Manischewitz Red Wine Cupcake. Plus, scroll down to win some awesome prizes! 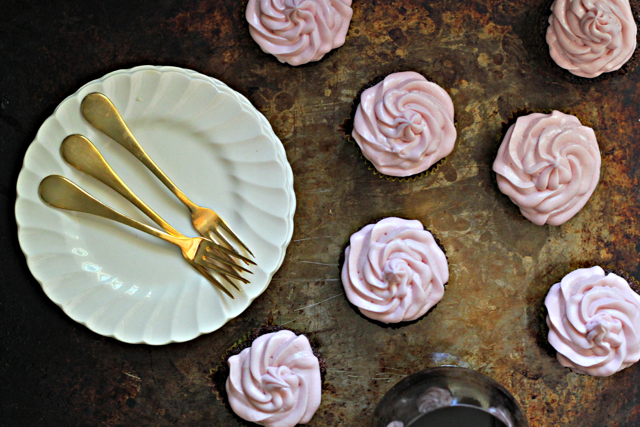 As I’m writing this, I’m thinking these cupcakes would be perfect for Mother’s Day. Damn! There I go, a day late and a dollar short. Plus I’m all out of wine. Or something like that. I mean chocolate and wine. It would have been epic! But, then it dawned on me. Why do you need a special day to make someone cupcakes? I talk about my Mom and Bubbe a lot on this blog, but sadly I don’t get to see them as much as I like because they live in cold Connecticut. And I like it hot in Texas. That doesn’t mean that they don’t call me to warn me when it’s snowing in Oklahoma and to make sure I eat breakfast. We talk pretty much all day daily, and I wouldn’t have it any other way. When I was deciding what to make this week, I noticed my leftover Manischewitz from Passover. That ish was going nowhere, fast. What to do with it? (Well besides, sangria, ice cream, short ribs, and Jell-O shots of course.) Then it hit me. Red wine and chocolate go together like, peanut butter and jelly. Or more likely champagne and an eye dropper’s worth of orange juice. Oh so well! 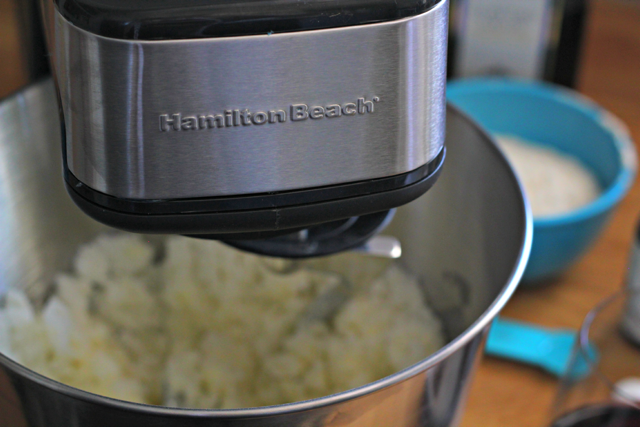 I used my new Hamilton Beach stand and hand mixers to make it happen. Want to win your own? You can! 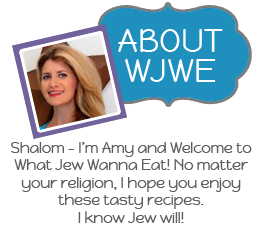 Scroll down to enter if you want to skip my rambling. I mean recipe. First up, let’s make the cupcakes. Preheat the over to 350 degrees F and line a muffin tin with cupcake lines. 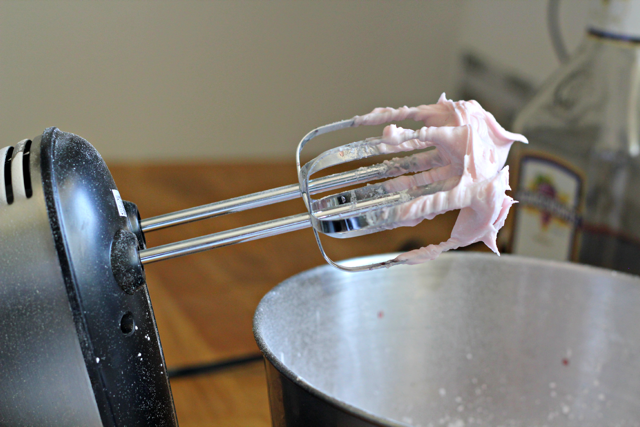 In your stand mixer, cream together butter and sugar until light and fluffy, about 2-3 minutes. Then add in the eggs and almond extract and mix. Then add in the wine! Last, add in flour, cocoa powder, baking powder and salt. Mix by hand to combine. 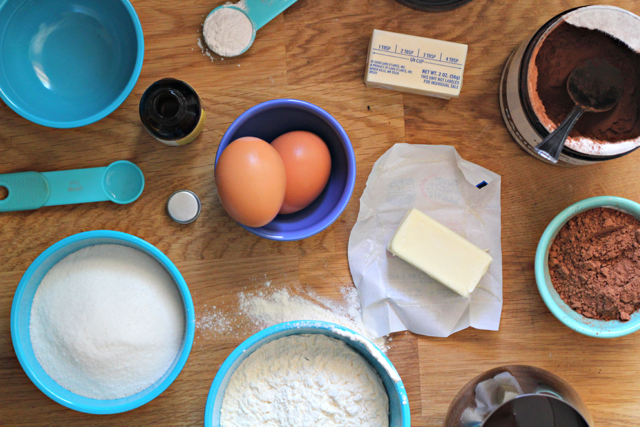 Divide the batter amongst the cupcake tins. Don’t make a mess like me! Bake for 18-20 minutes and let cool for 5 minutes before finishing cooling on a wire rack. 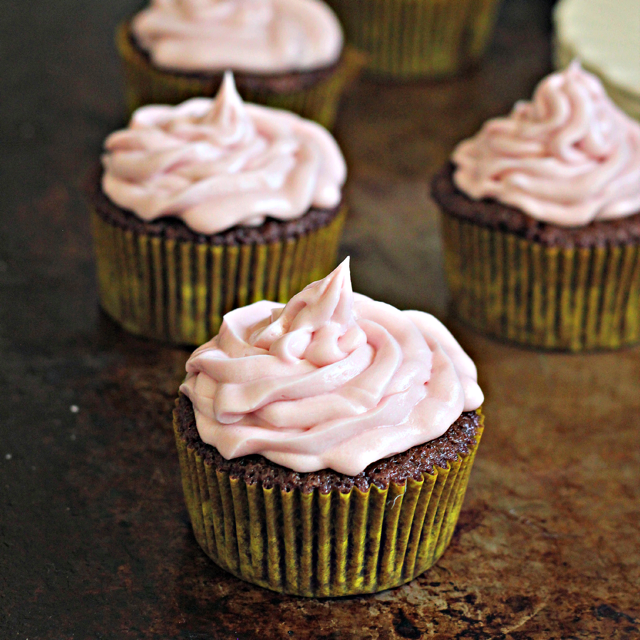 While the cupcakes are cooling, make some frosting! I used my hand mixer for this part. It’s way easier than messing up the whole mixer deal. Mix the butter until it’s light and fluffy. Then add in the powdered sugar and carefully stir. Add in the wine until your frosting is the desired consistency. Don’t make a mess. Do lick the beaters! Frost your cooled cupcakes and eat. Preferably with another glass of wine. Note to self. Eat all cupcakes before they melt in the Texas heat. Sigh. Maybe Bubbe had it right all along! And now, for the giveaway! Whoop! 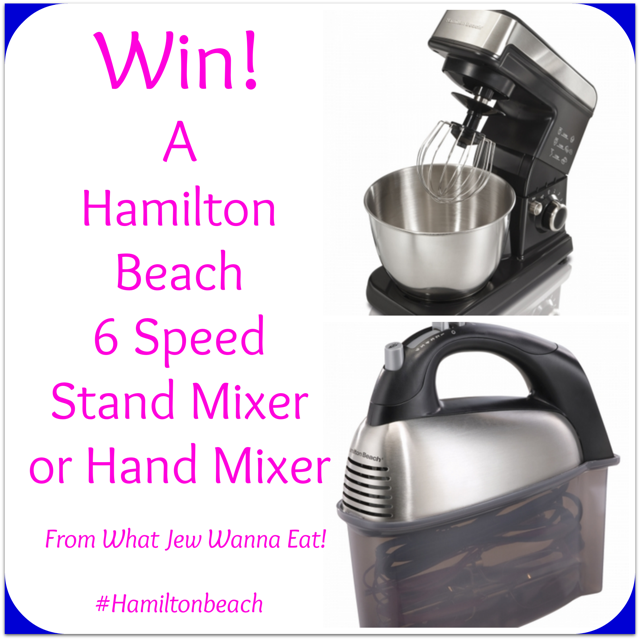 One winner will win a Hamilton Beach 6 Speed Stand Mixer and one will win a Six Speed Hand Mixer! The hand mixer has SoftScrape technology so you don’t have to stop to scrape the sides while mixing (that’s the worst, right??) and the stand mixer has a super powerful 300 watt motor. 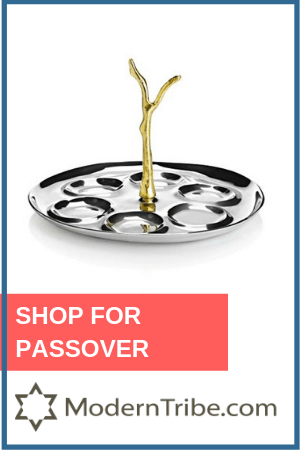 Certainly powerful enough to make some challah! What do you do with extra red wine? 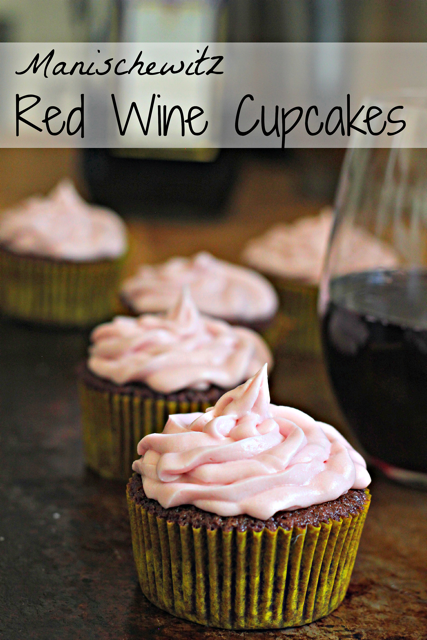 Manischewitz Red Wine Cupcakes of course! Preheat the over to 350 degrees F and line a muffin tin with cupcake lines. In your stand mixer, cream together butter and sugar until light and fluffy, about 2-3 minutes. Then add in the eggs and almond extract and mix. Then add in the wine! Last, add in flour, cocoa powder, baking powder and salt. Mix by hand to combine. Two winners will be chosen once the giveaway ends and they will have 48 hours to respond to the email sent to them or another winner will be chosen. Winners must be 18 years or older and live in the USA. This giveaway is sponsored by Hamilton Beach but all opinions are my own. Thanks for the support and good luck! I’m not sure I understand the blog prompt, but these look delicious, and like an excellent use for leftover wine from passover! I like the image showing all the ingredients. I don’t see any decal images, but these cupcakes look wonderful! This is an absolutely fabulous giveaway! I’m going with your decal image the unicorn is awesome and I don’t have a hand mixer-so I have to lug out my red Cuisinart Stand mixer (which i love). Not sure what the decal image question means, but you had me at wine and cupcakes! I can’t find any decals to comment on, but I hope I can participate in this generous giveaway. What a wonderful giveaway. The photos are enticing and the cupcakes look delectable. I don’t know where there is a decal here, but I do like your website and the terrific giveaway. I’m not sure what the decal was supposed to be, but the cupcakes look like something I must try and ones to even open a new bottle of red wine for :)! i’m not sure i know the meaning of “leftover wine” …. Other than at Passover (Manischewitz) I never have “left over” wine. Completely new concept to me! 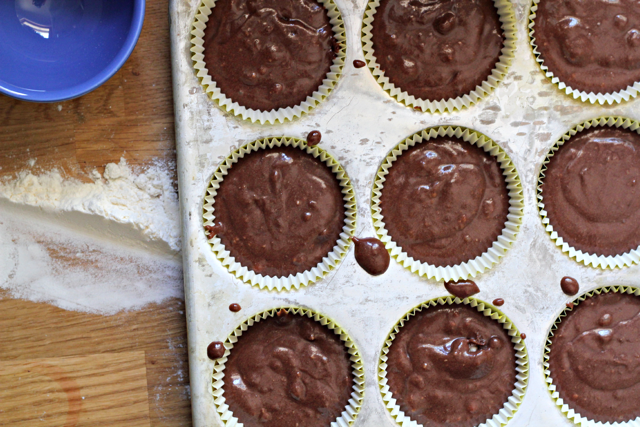 😉 But seriosuly, I can’t wait to try making a gluten free version of these cupcakes. I use lots of dry (maybe not the manishewitz type) when braising lamb shanks or osso bucco. 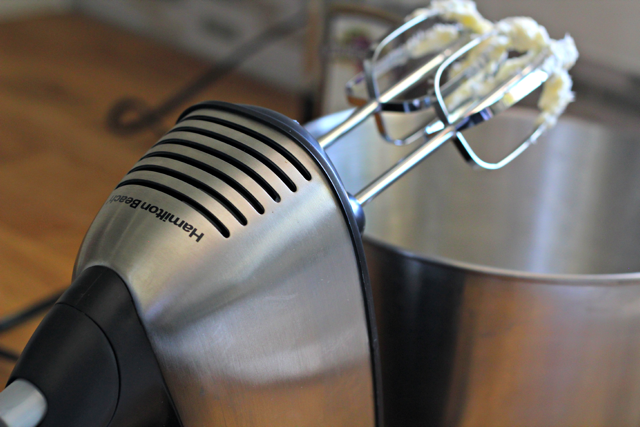 I have been using a Hamilton Beach hand mixer for over 30 years on a consistent basis. Its great. I use it for a chicken marinade. I usually have too many friends and not enough wine to serve. 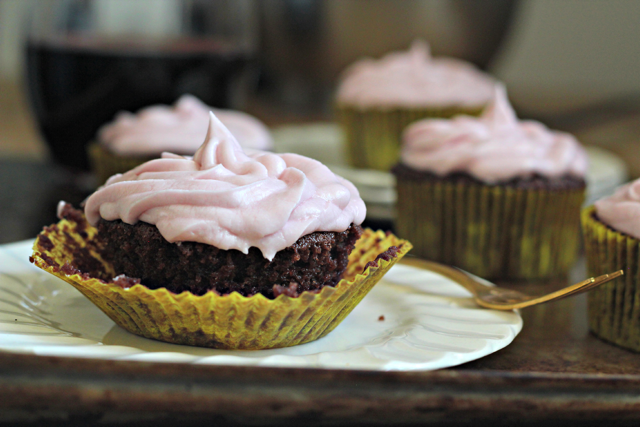 Although, the recipe for Manischewitz Red Wine Cupcakes looks divine. Can’t wait to try them. 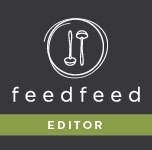 Most left-over wine goes in the chicken pot (almost regardless of the recipe – ha! ), but a sweet wine like the Manischewitz I would have been stumped until now! AWESOME giveaway idea. I like your mention of “leftover” wine… LOL You mean I wasn’t supposed to polish off the bottle right away? Not sure what leftover wine is 🙂 But those cupcakes sound awesome! I never have leftover wine! If I did, I would try this recipe! 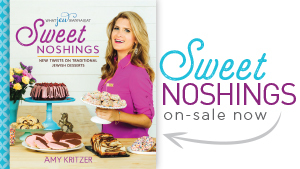 I use it to soak dry fruits for christmas desserts recipes! IF there was any leftover wine, I’d cook it down into a syrup (wouldn’t take long with all that sugar!) and drizzle it over chocolate ice cream. Oy! I like sauteing with leftover dry wine. Leftover sweet wine gets turned into sangria. What is this ‘leftover’ wine you speak of?? haha! Seriously though, can you substitute almond extract with vanilla extract?? I know people who’d like these, but they have nut allergies…one specifically to anything almond. If I ever have leftover wine, I will give this a try. Wonder if it would work with potato starch sponge cake? I use my leftover wine to make a chocolate cake or beef bourginon. Making these cupcakes of course! 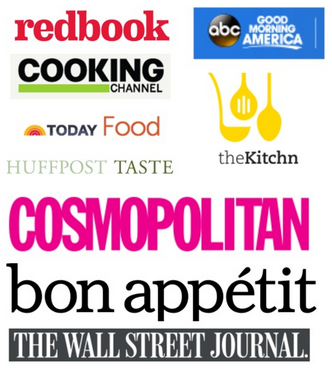 I use left over wine in chicken or seafood recipes (depending on the type) as well as in sauces. I usually use it in a marinade. I use leftover wine in my beef roasts. I use it to marinade my chicken ka bobs! So good! I don’t drink, so never have wine at all. But those cupcakes look delicious!